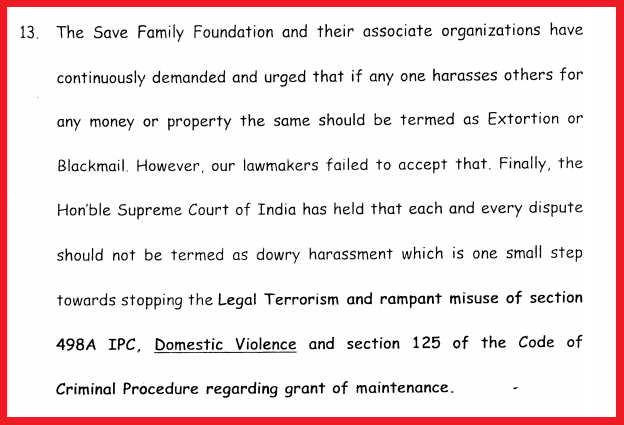 When, in 2005, Save Indian Family Movement was founded, Men were already ignored and the Law Makers, under the pressure from heavily funded Feminist groups were coming up with Legislations, which in name of Women Empowerment were creating “assassin’s weapon” to penalize Men and bring in more and more hatred against men in the society. Since then, Save Indian Family (SIF) Movement has helped over 10 Lakh families across the globe who have been suffering at the hands of various Gender Biased Laws of India. Through it’s various allied NGOs, including (SFF) Save Family Foundation, Delhi (Regd. NGO), SIF has been tirelessly working towards bringing peace and harmony to lives of Men and their family members dues to various False and Frivolous litigation instituted via these “Easy to Misuse” Gender Biased Laws. 2006, an old age couple reached the Hon'ble Trial Court of India as the wife filed a case against her husband under Protection of Women from Domestic Violence Act, 2005. The case when on for over 3 years and finally the Hon'ble Judicial Magistrate of First Class in a district in Haryana state delivered a Judgement that can definitely be termed as "LANDMARK" in all senses. While the Hon'ble court was addressing the allegation levied against the Old aged Husband, around Domestic Violence, Maintenance, Residence order etc., the Hon'ble Court went through various Judgements from Hon'ble Supreme Court & Hon'ble High Courts of India. The order is a REAL JUSTICE deliverer as it just dint examined and cited the following judgements but applied them to keep that faith up in the Judicial System for men. Hon'ble Supreme Court: ASHOK CHATURVEDI & ORS. vs. SHITUL H CHANCHANI & ANR. Hon'ble Supreme Court: STATE OF HARYANA AND ORS. vs. CH. BHAJAN LAL AND ORS. The Hon'ble JMFC, ordered that the instant matter does not qualify to be given any relief sought. Infact, in Point No. 13 of the Order, the Hon'ble JMFC acknowledges the efforts put in by Save Indian Family (SIF) Movement to bring to the notice of the Judiciary the widespread menace of misuse of Gender Biased Laws. WE CONGRATULATE ALL THE CRUSADERS OF SAVE INDIAN FAMILY WHO WORKED SELFLESSLY TO ACHIEVE THIS BEST EVER MILESTONE. well done everyone. it has been a long journey, but every step was and will be worth it! Kaafile baste Gaye Hindostan Banta Gaya. SIF, hindosta bachta gaya !! Well Done.... And heartieous congratulation for being highlighted. Really its a great achievement for team SIF. Each individual have to fight this menace of legal terrorism. One day will come when 498a will be considered as family dispute and will come under civil court. All please contribute in activism then only crime on husbands will be reduced.. Many congratulations and Thanks to all the members of SIF. Really its because of your firm determination for the Fight against legal terrorism that this milestone can be achieved.